Navigate life's twists and turns with the world's first rotating bezel. Take control of your health. And make the most of your favourite apps. Can be paired with smartphones on Android 4.4 and higher, with over 1.5GB RAM. Get a watch as unique as you are with the range of face designs. Match it with your outfit, make a style statement or just shake things up whenever you want. The world's first rotating bezel allows you to get to all your essentials with a simple twist. Just turn it round to scroll through long emails, zoom into a map or skip to the next track. 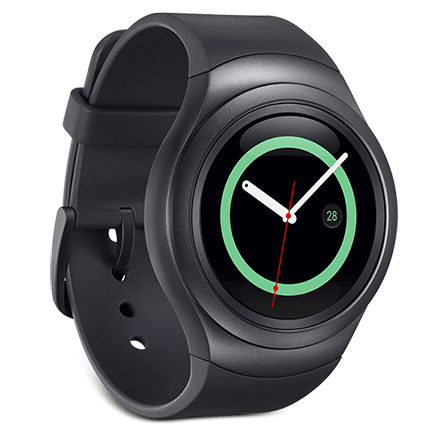 And select your favourite apps and settings without blocking the Gear S2's display. Taking control of your health and fitness is a walk in the park. Track your daily activity levels, monitor your heart rate and see how much water you wash down and caffeine you consume. And if your motivation starts to fade, messages from your Gear S2 will soon get you back on track. The Gear S2 comes with a growing range of apps to help you get the most out of your day. Check your Tweets and messages. Get your team's scores as they happen. Read the daily news. Make every moment count. Sync up to 300 songs from your smartphone for instant access anytime, anywhere. Leave your phone at home when you go for a run or to the gym, but always have the perfect playlist with your Gear S2. Keep up to date, control your fitness and manage your music without worrying that your Gear S2 will run out of juice. It's got plenty of charge for a couple of days. Then just pop it on its wireless dock to power it back up.